The recently completed large field was my primary mowing project for this fall. 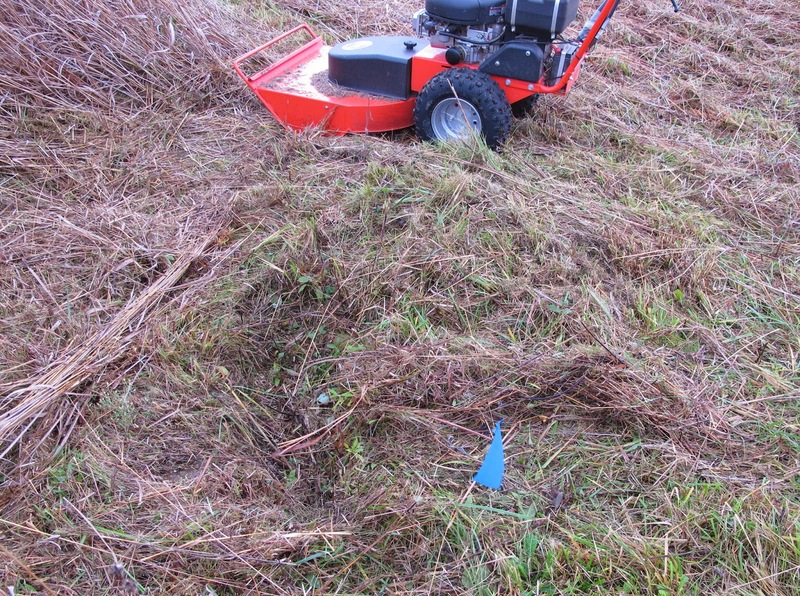 Now I’m working on mowing odd patches that were once strongholds for woody invasive species. 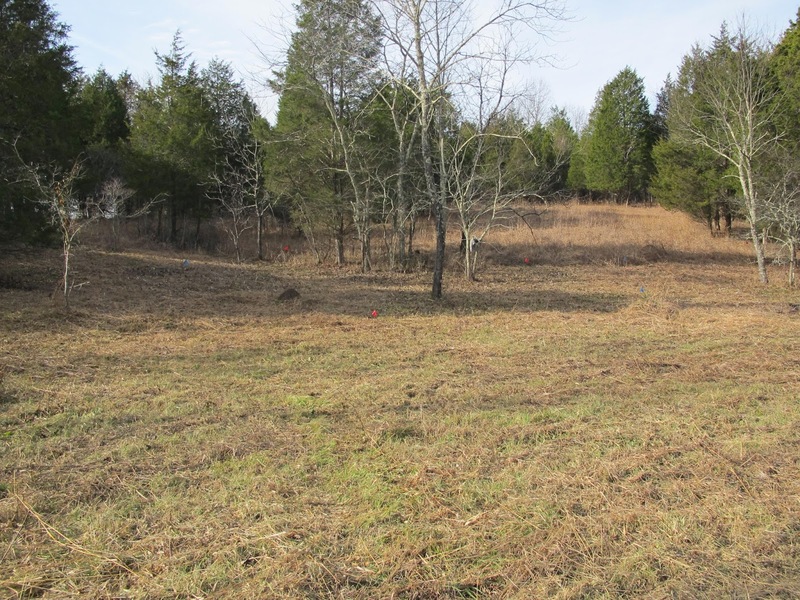 This 0.2 acre plot is typical of the areas I’m dealing with. 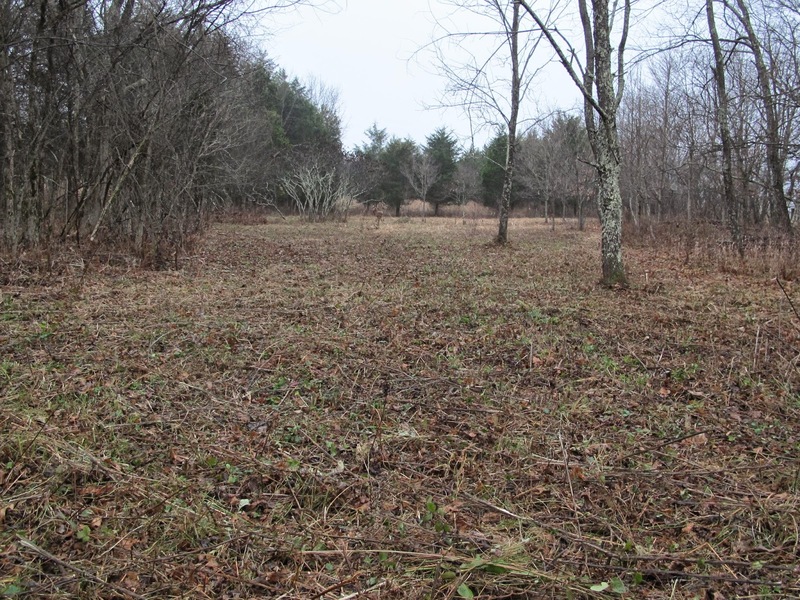 The front half of this field contains a thriving stand of Dwarf Sumac and needs to be mowed every two or three years to keep the sumac from taking over. 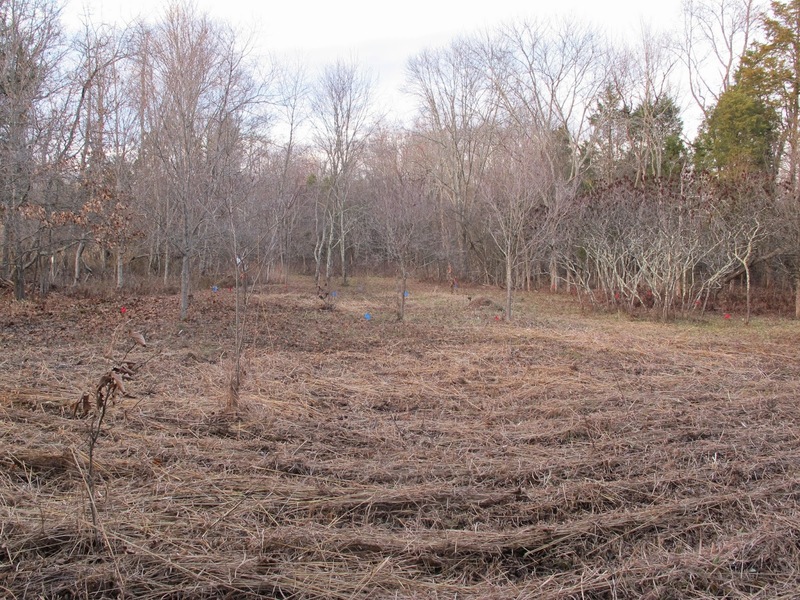 The far end of the field was once a solid thicket of Multiflora Rose. The Sumacs are easy to keep under control by mowing. 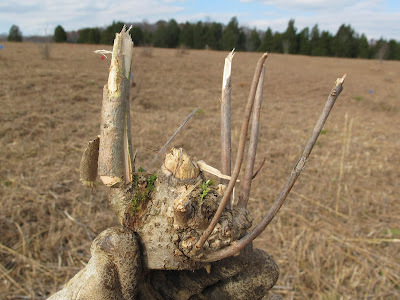 Instead of producing a mass of stump sprouts, which would result in a dense cluster of stems at the base of each cut plant, the Sumacs produce root sprouts that are scattered widely about the area. If a stump sprout does occur, it is most likely to be a single shoot. The mass of light colored trunks topped by red fruit clusters on the right side of the photo is a stand of mature Dwarf Sumacs that I have allowed to grow unmowed. That illustrates what the rest of the field would look like if mowing was stopped. 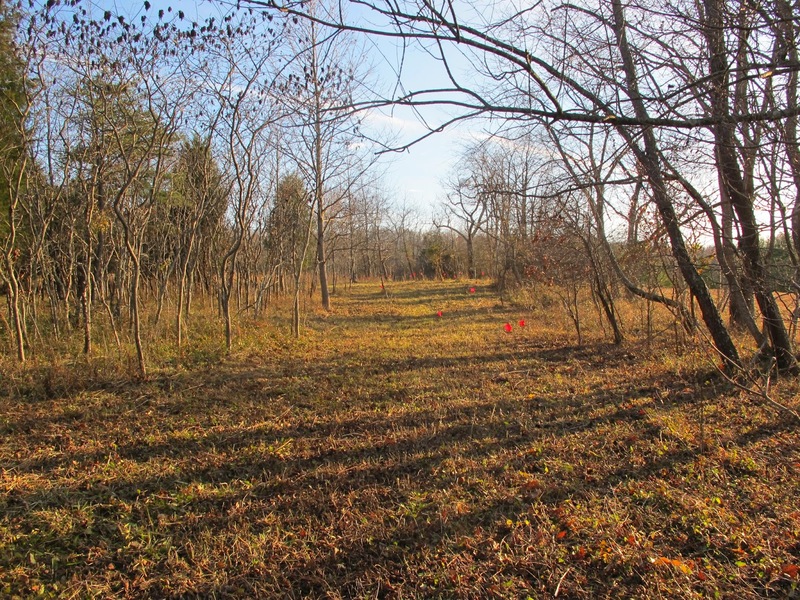 This end of the field, out as far as the second tree, was once a nearly impenetrable thicket of Multiflora Rose. I say nearly impenetrable, because I managed to fight my way to the center and slowly cut my way out in all directions. Since then, native plants have been quickly filling in and this year, I only found five small rose canes requiring herbicide treatment. 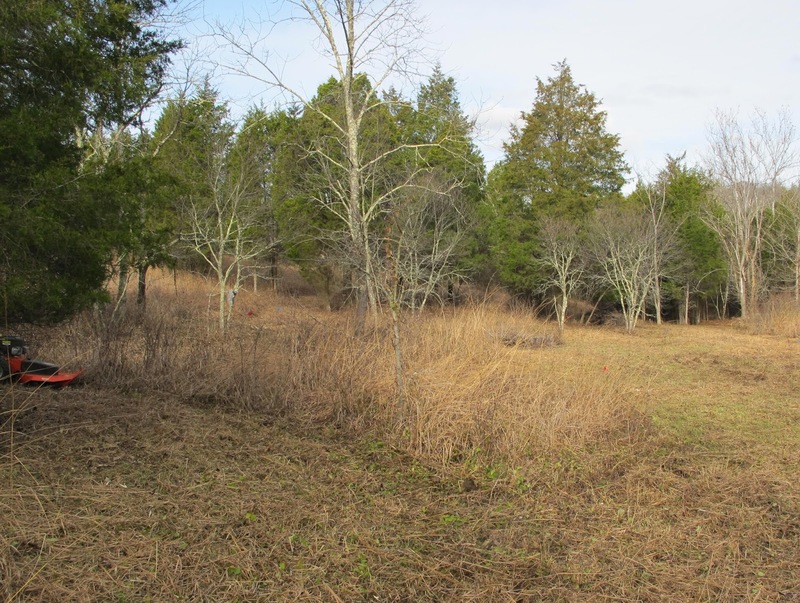 This area used to require annual mowing and herbicide treatment to eliminate a variety of woody plants. This end is now relatively free of invaders and didn’t require any attention this year. The other end still has a strong stand of mixed Sumacs that need to be controlled. 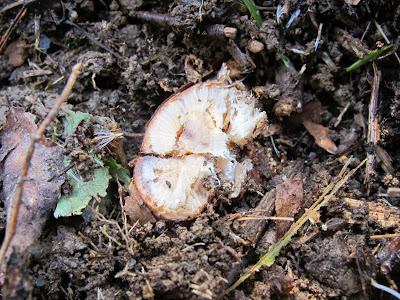 There is also a continuous incursion of seedlings from Walnut, Ash, Cherry and Persimmon that must be cut and treated. The trees and shrubs are only a problem in the deeper soil of this narrow valley. Soil eroding from the neighboring hillsides settled in the valley and created soil depths in excess of four feet. 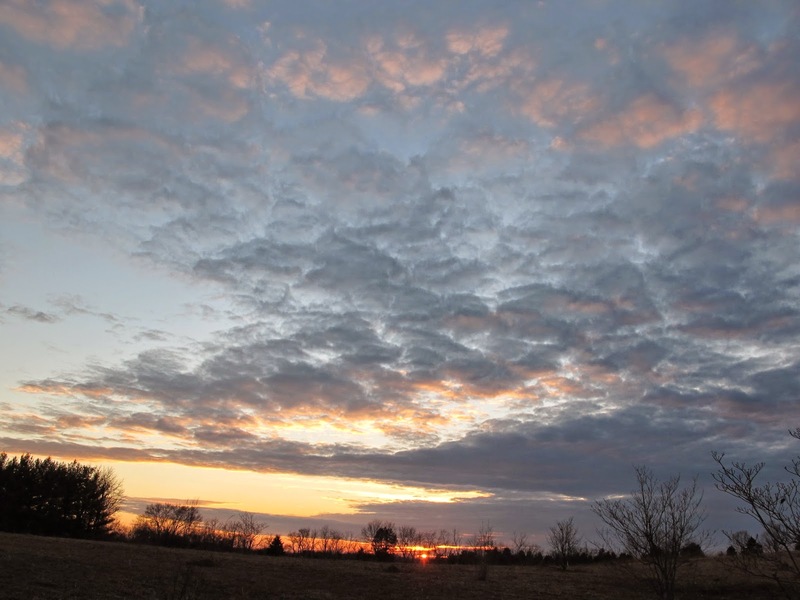 The hillsides have a soil depth of eight inches or less to bedrock. 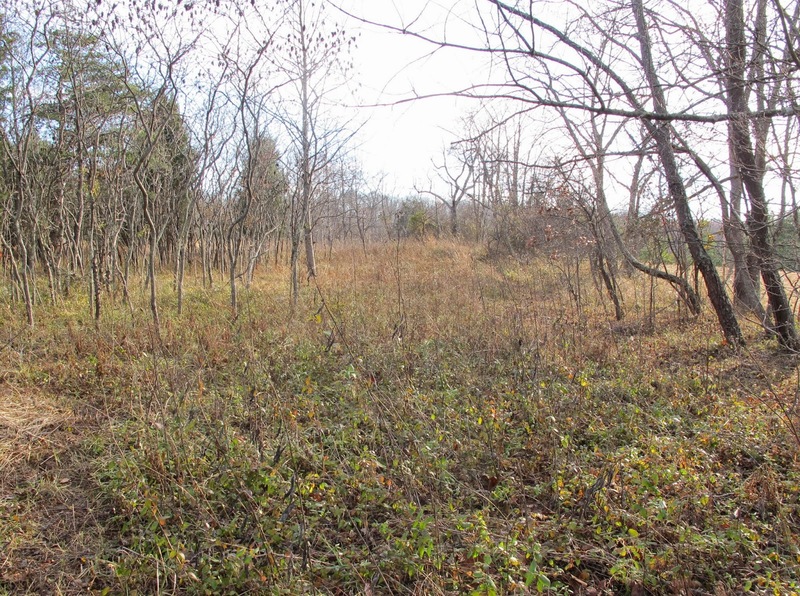 At one time, the deep valley soils supported a thick stand of Sumacs mixed with trees of several other species. I cleared the trees so the prairies on each side of the valley could join. Clearing the trees resulted in a series of several brush piles down the valley. The young Hackberry shown in the lower left of the photo originally sprouted from a large pile of cut Sumacs. 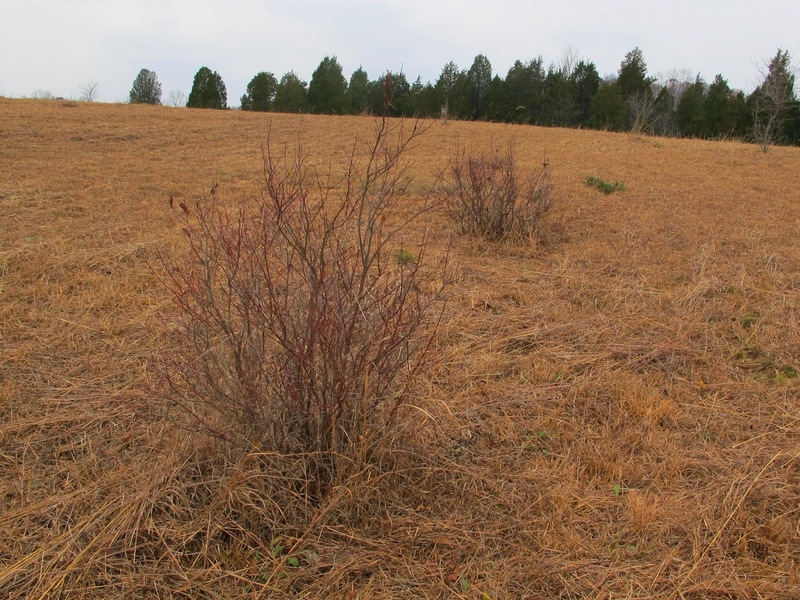 Sumacs decompose quickly and the pile, once six feet high, has completely disappeared. A second old brush pile can be seen in the center of the photo and there is a third just visible beneath the cedars in the distance. 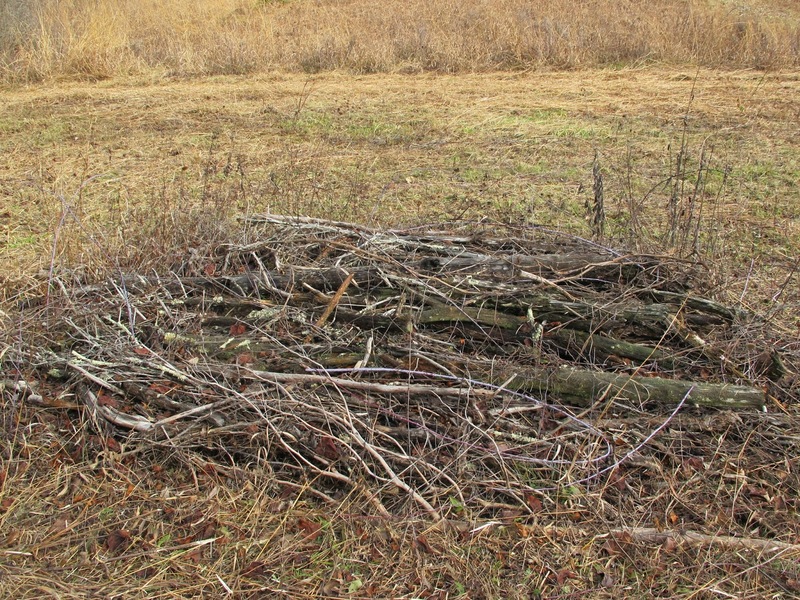 This brush pile was composed of a mix of larger species. Its six foot height has dwindled to about 18 inches, but there are some Red Cedar logs that will probably last longer than I will. I’ve maintained a single active pile tucked in next to a group of large cedars. 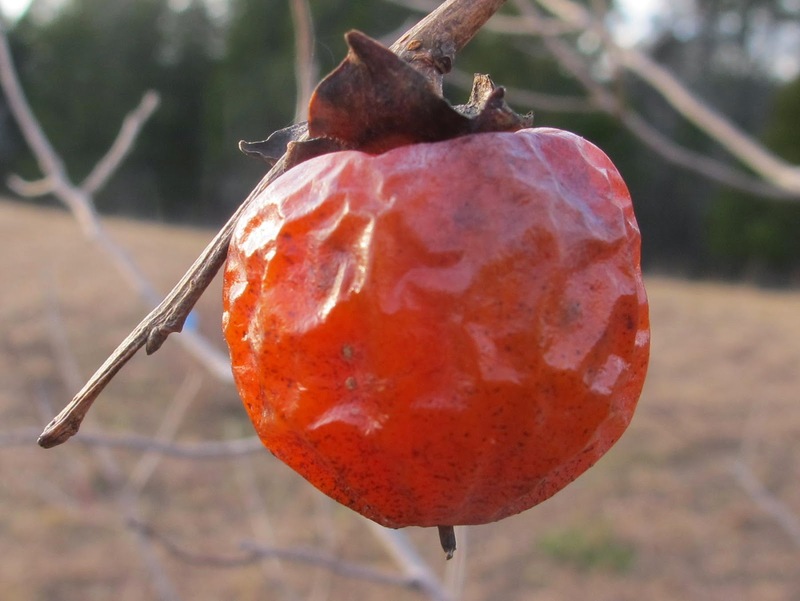 It is currently capped with a collection of young Persimmons that were removed from the mowing site. 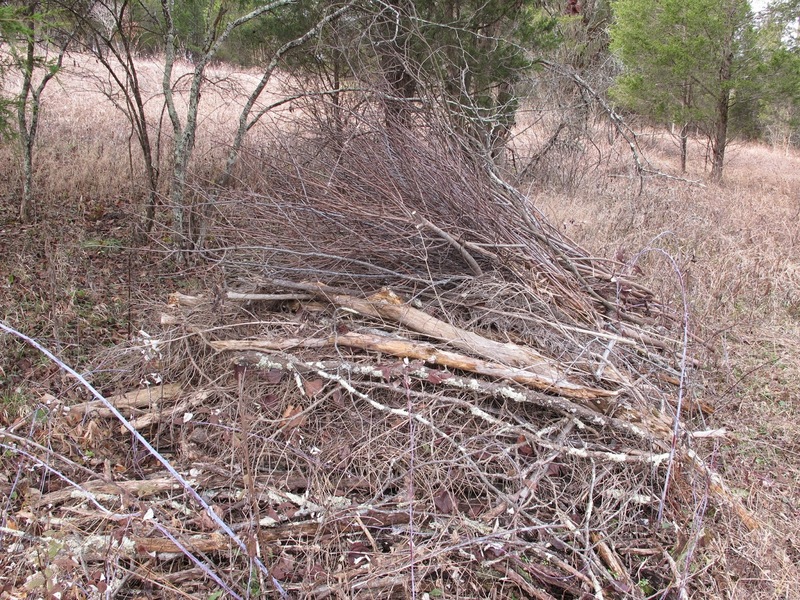 Carolina Wrens love this type of brush pile and nest here each season. This narrow strip beside an old fence row had the worst infestation of young Autumn Olive bushes of any place on the property. 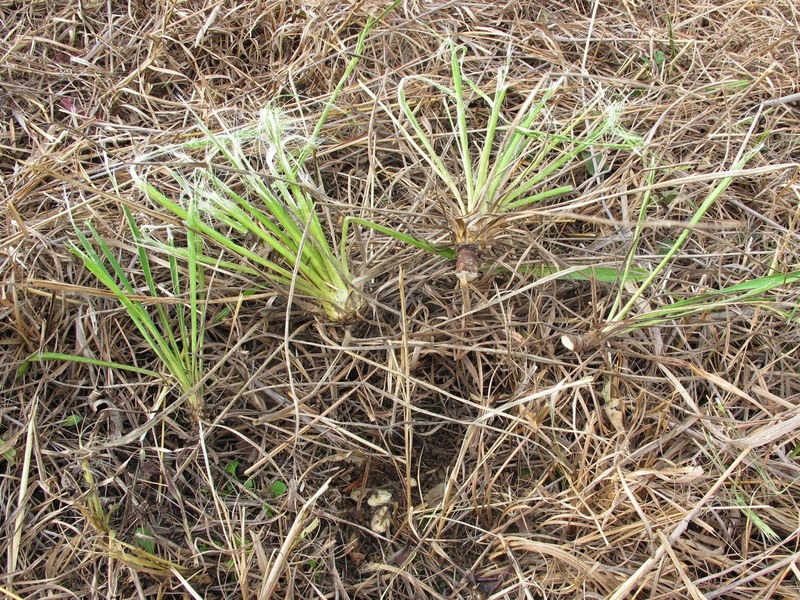 Mature plants have been eliminated, but a flush of new sprouts appears every year. This year’s crop was much reduced over last year. I’m guessing it will be a couple more years yet before I consider things under control here. I was through this area last month and did a pretty thorough job of cutting and treating Autumn Olive. Only three of those red flags are marking Autumn Olive that still need treatment. The rest of the flags are young Black Walnuts. The large field that was just mowed can be seen through the tree trunks to the right. Even when the trees block my view of the horizon, the rapid drop in temperature alerts me to the fact that my work day is coming to an end. That tiny little bit of sunlight is generally all that illuminates my documentary photos of work completed. It’s no wonder so many of them are slightly blurred and lacking in detail. 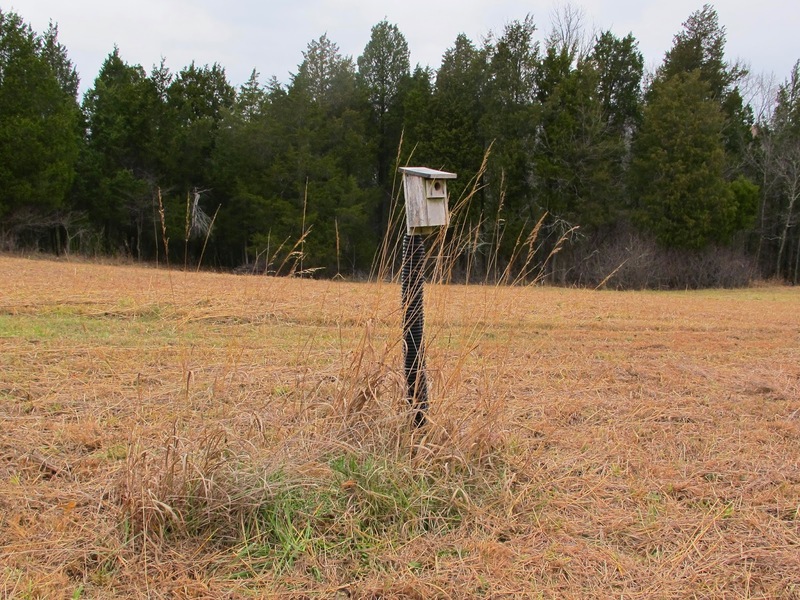 I know that a lot of birds nest in the tall grass fields. 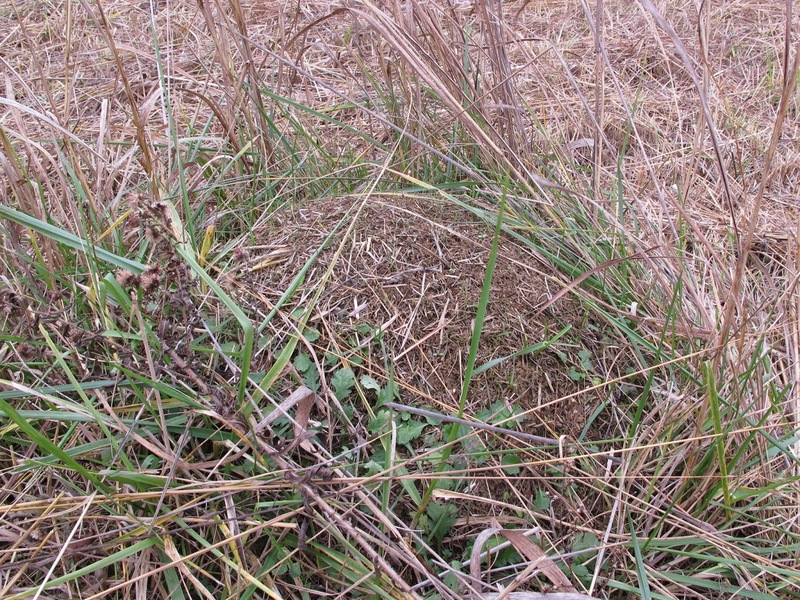 Even so, it’s rare to actually find one of the nests in the grass. 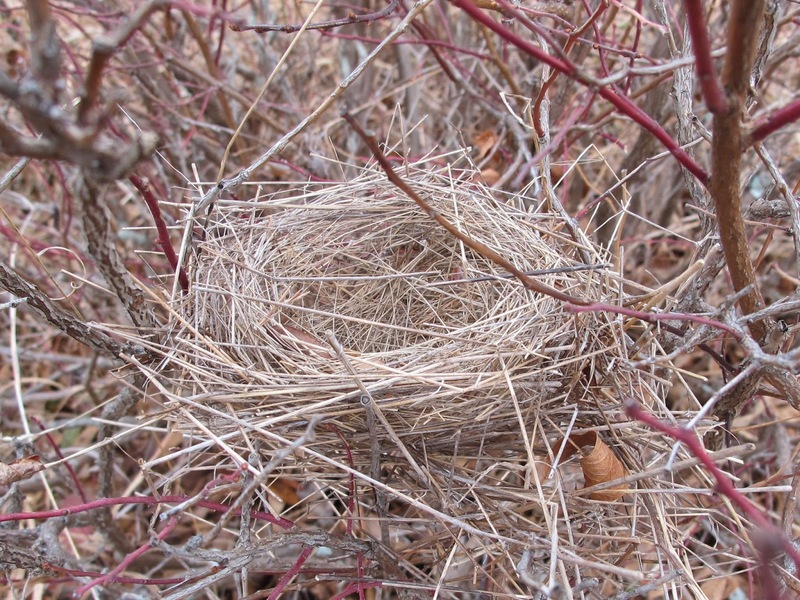 Where I always do find nests is in the small trees and shrubs growing hidden among the grass stems. This Field Sparrow nest was nestled into the lower branches of one of the smaller Flowering Dogwoods. Field Sparrows are quite common in the fields of prairie grasses and will generally raise two broods of young each year. 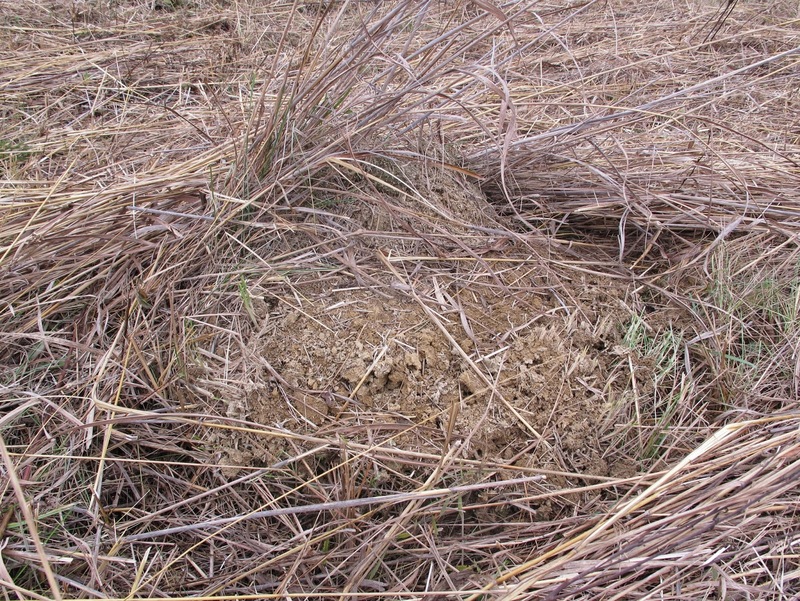 The early season nests are produced when the field vegetation is still short, so the nests are constructed on or close to the ground where there is plenty of cover. 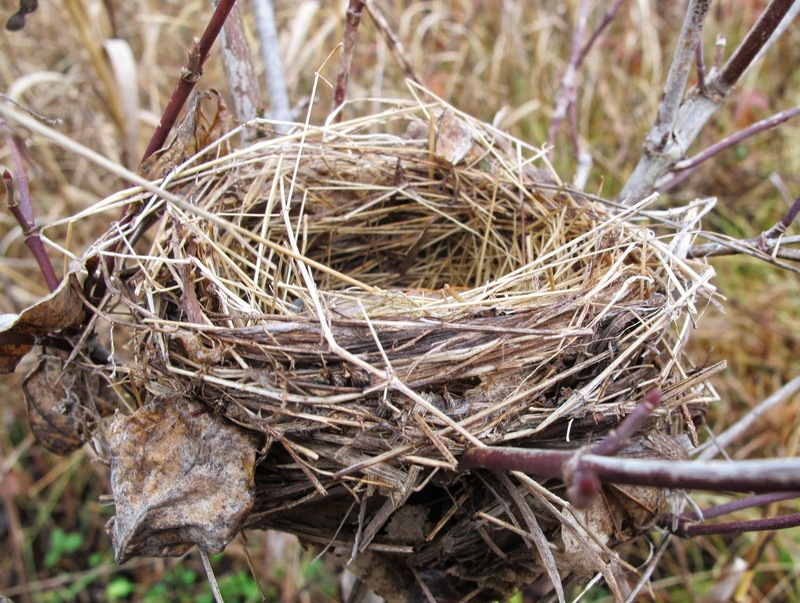 By the time the birds construct their second nest, the grasses have grown up to engulf the small shrubs and trees. 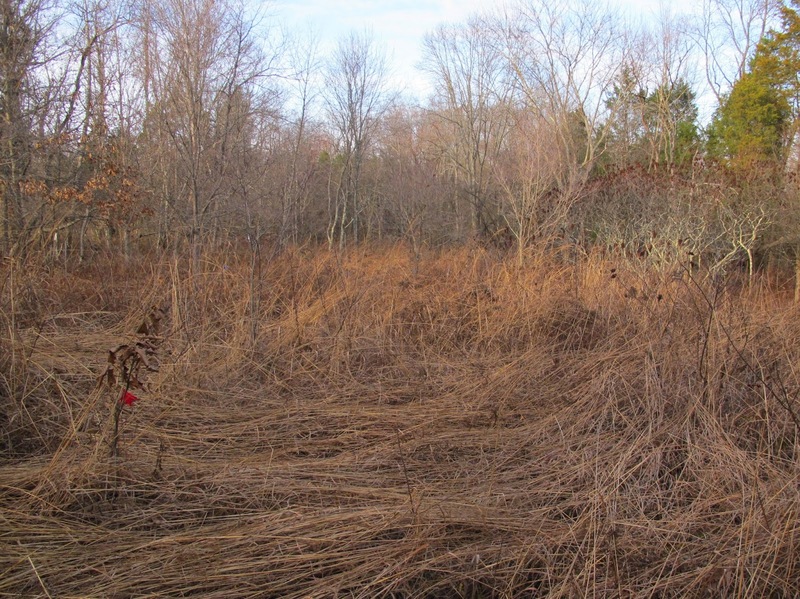 Late season nests are regularly built in the lower branches of these grass hidden woody species. 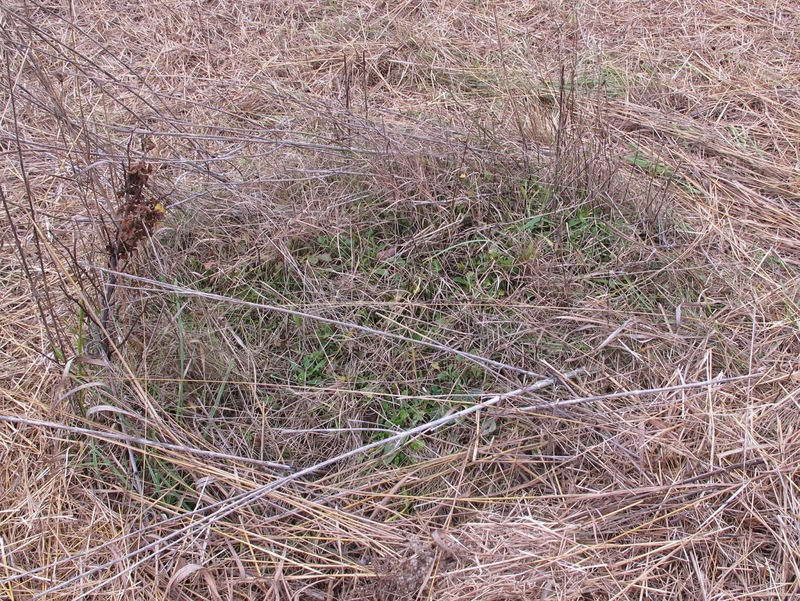 When this Field Sparrow nest was in use, the surrounding grass was probably taller than the Deerberry bush in which the nest was built. 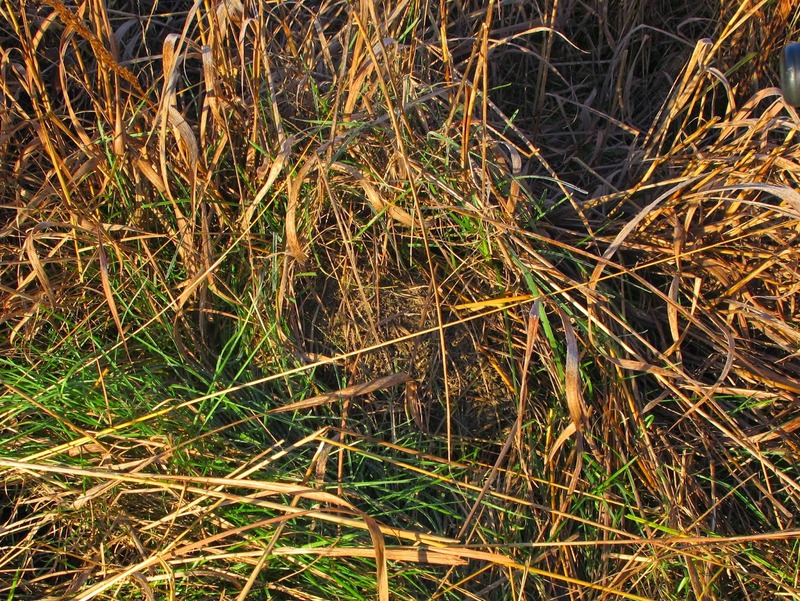 The combination of grass and leafy shrub would have made the nest impossible to see. The woody shrub seems a wise location for a nest. Summer storms can sometimes put the tall grass stalks through some wild gyrations that could easily damage a fragile nest. 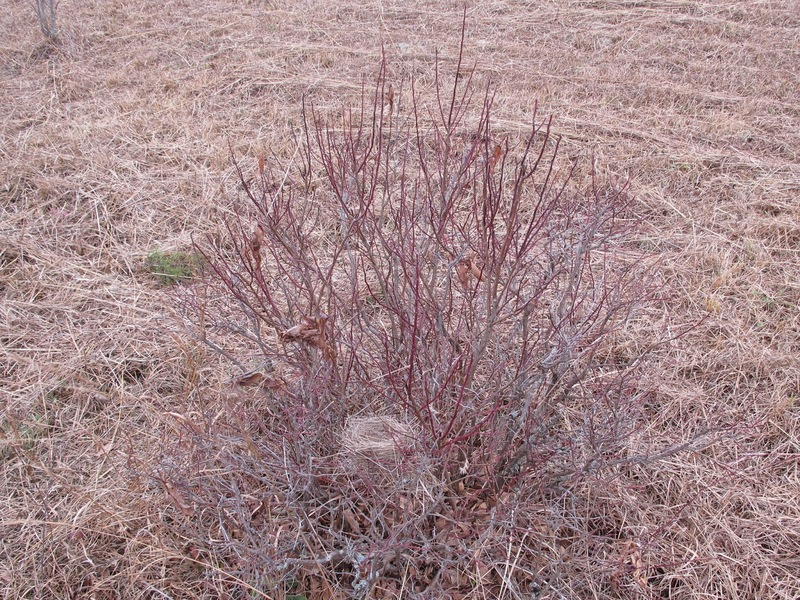 The support offered by the shrub would protect the nest from such wild storm events. Goldfinches are abundant here and regularly use the small trees in the field as nest sites. 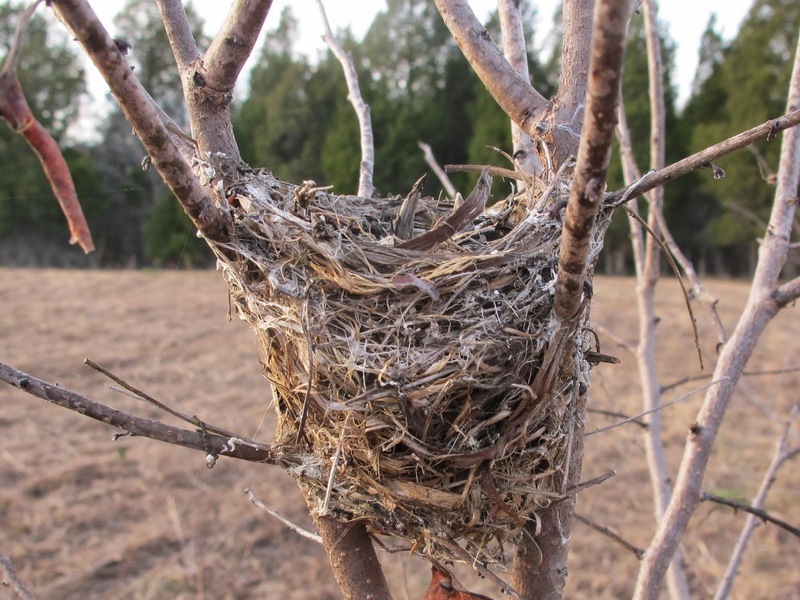 Most nests are located between four and eight feet above the ground in the branches of Flowering Dogwoods. 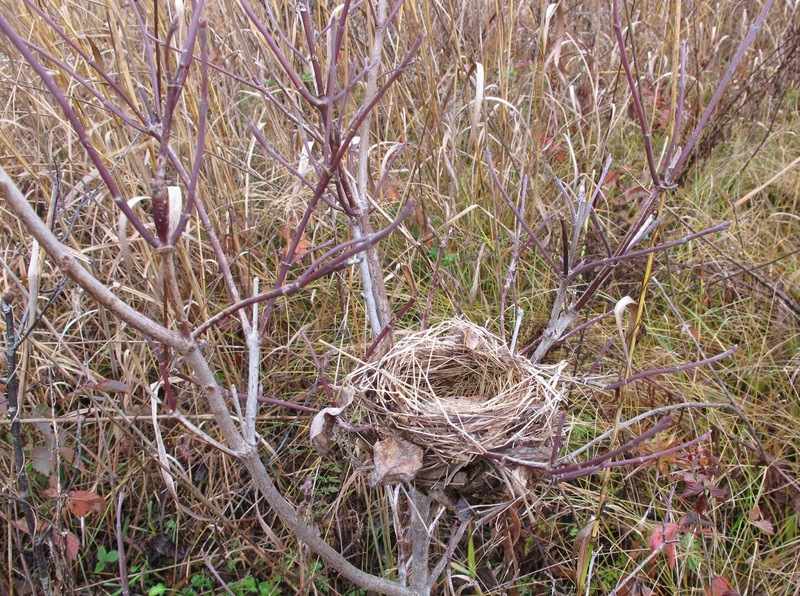 This nest is typical of what I find each year after the leaves have fallen. A couple of Goldfinch pairs used the young Persimmons as nesting sites. These trees have since been cut, so they won’t be available next year. 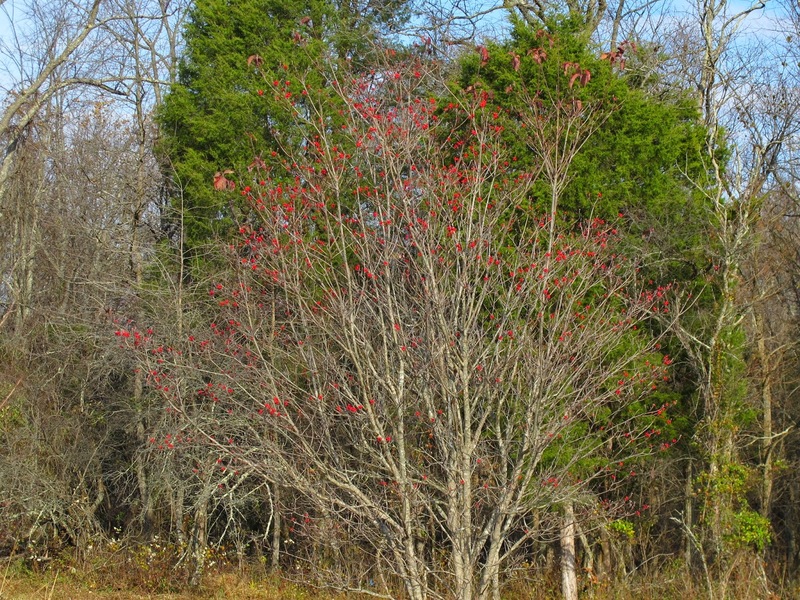 However, there are still plenty of Dogwoods left for use as nest trees. 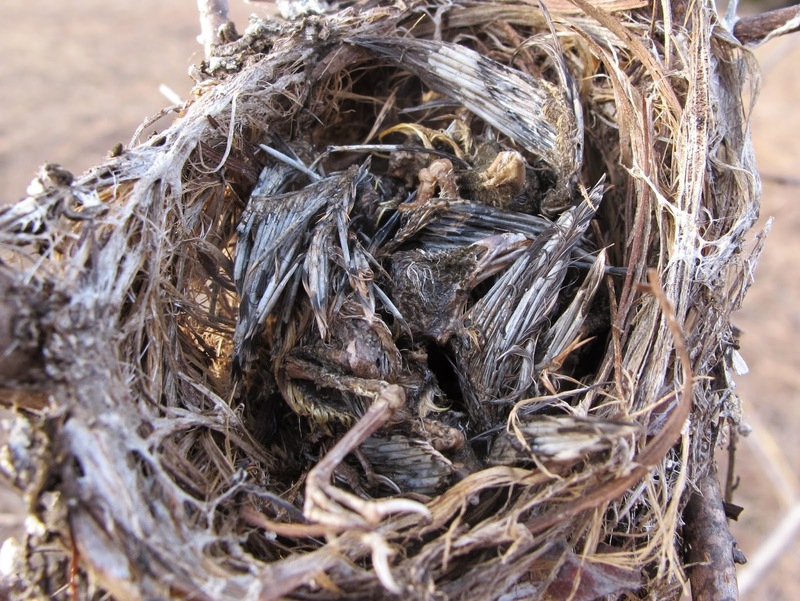 The nest has weathered a bit since the fledging of the young birds, but the thistle down lining is still easy to see. This nest, secured in the upper branches of a young Persimmon, appeared to have collected leaves and twigs in the cup. I bent the tree over to clear the debris and have a look at the nest construction. Instead of leaves, I found what was left of the young birds. Not all nestlings survive, but it’s unusual to find the bodies like this. They may have succumbed to disease or parasites or weather or loss of the parent birds or something else entirely. It’s sad to find things like this, but it might be worse in a different way if all young animals managed to reach adulthood. The most frequent comment I get from people seeing my newly mowed fields is “Hey, you missed something.” My conversational skills are almost nonexistent, so I’m never quite sure how to respond to that kind of comment. Since it’s not a question, I don’t think I’m obligated to respond. I usually just acknowledge the accuracy of their statement and stare at them until they walk away. Do they honestly believe that I’m unaware of the fact that there are things in the field left unmowed? Of course I missed something. I meant to. If I intended mow everything in the field, I could just grind it all down with a ten foot Bush Hog. My primary objective is to remove unwanted features from the field and I do all that is necessary to achieve that objective. Beyond that, I also wish certain features to remain untouched, so the mower is carefully guided to avoid key items. I made earlier mention of my desire to avoid destruction of the ant mounds, but there are many other things that I hope to keep intact. I doubt that anyone would question why I failed to mow down the bird boxes. Flowering Dogwoods are thriving in the field. About 20 years ago, disease eliminated the Flowering Dogwoods from my woodland understory. 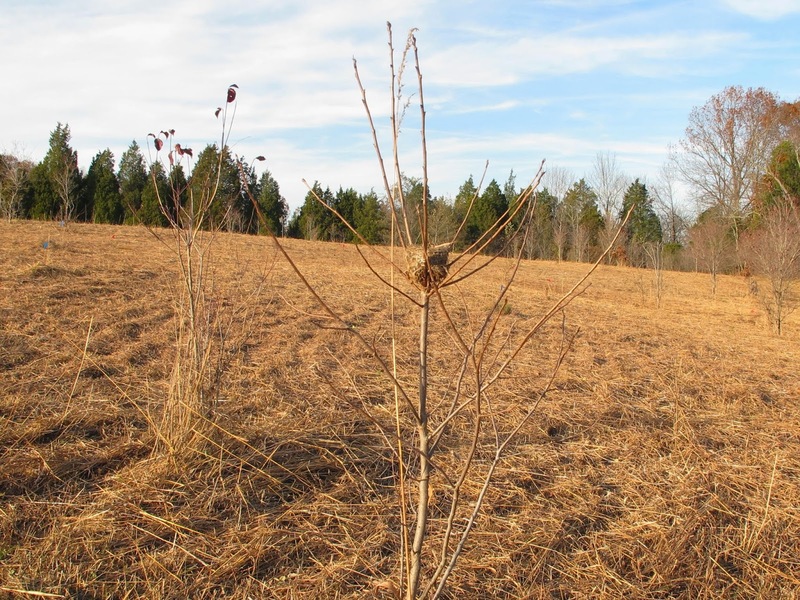 That left a few young sprouts in the old crop fields as the only living dogwoods on the property. I selected about 25 sprouts and allowed them to grow to maturity. They now flower heavily and provide an abundance of fruit each year. I keep hoping to find some young dogwoods recolonizing the woods, but that has yet to happen. 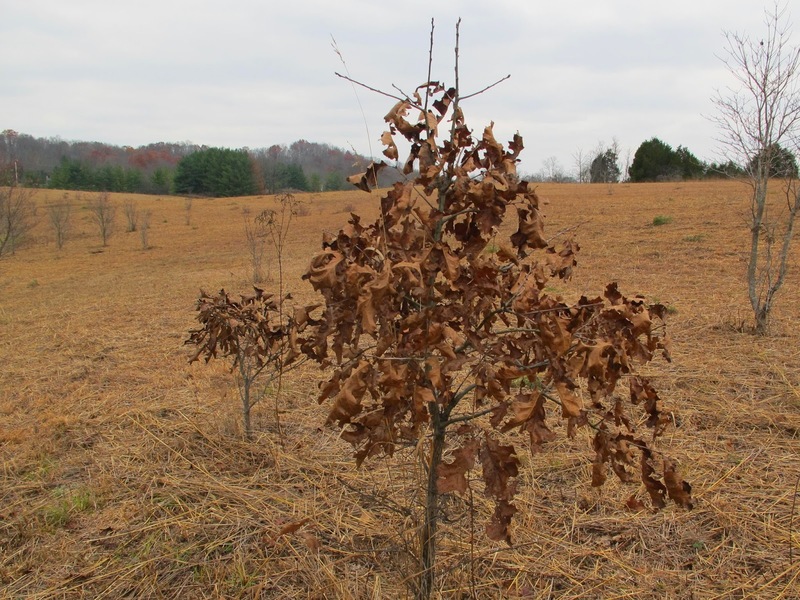 I’m allowing a few Blackjack Oaks, Quercus marilandica, to grow near some of the ant mounds. Where the Allegheny Mound Ants live in close proximity to the Blackjack Oaks, there is a chance of encountering the uncommon Edwards’ Hairstreak butterfly. The butterflies lay their eggs on the oak and the ants provide protection to the butterfly during its early stages of life. This wonderful association exists on other parts of the property and I am encouraging it to spread. 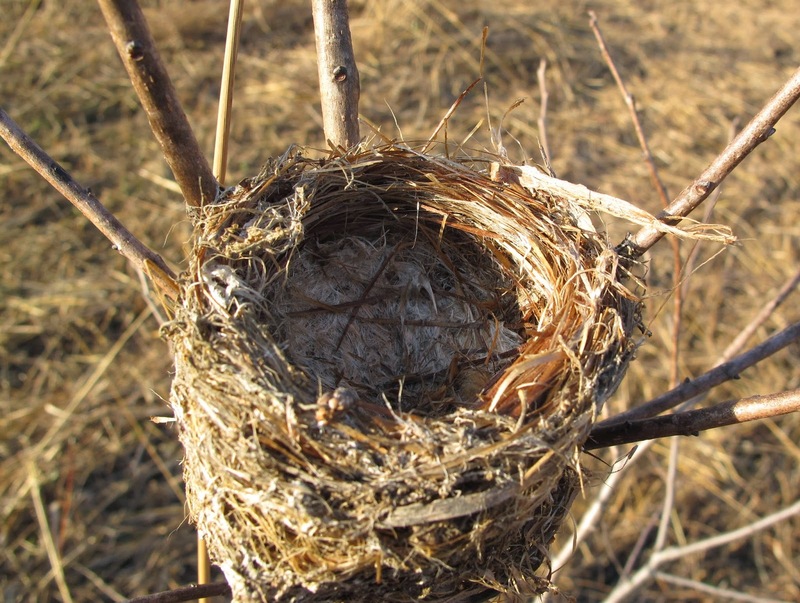 Small shrubs and trees growing in association with the tall prairie grasses provide ideal structure for the placement of bird nests. Deerberry is an ideal species for this activity. 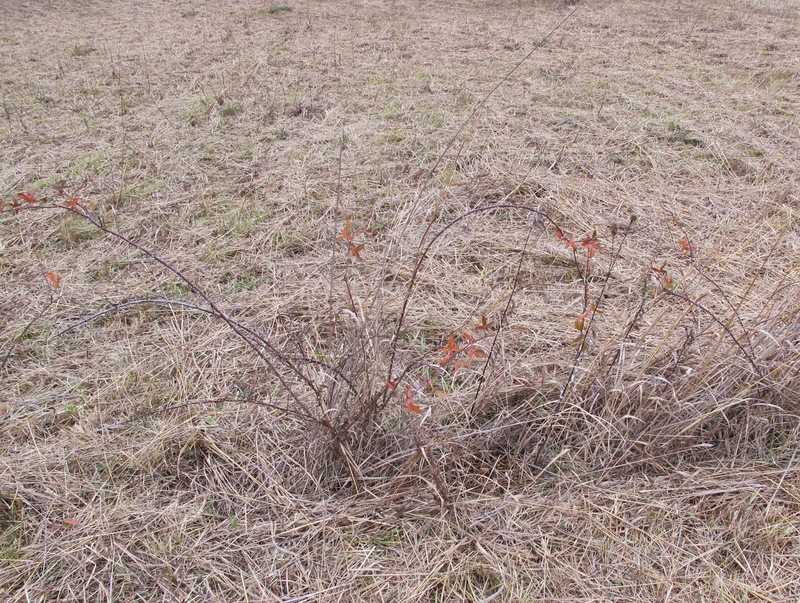 So far, Deerberry has been slow to establish in the fields and slow to expand its clumps. 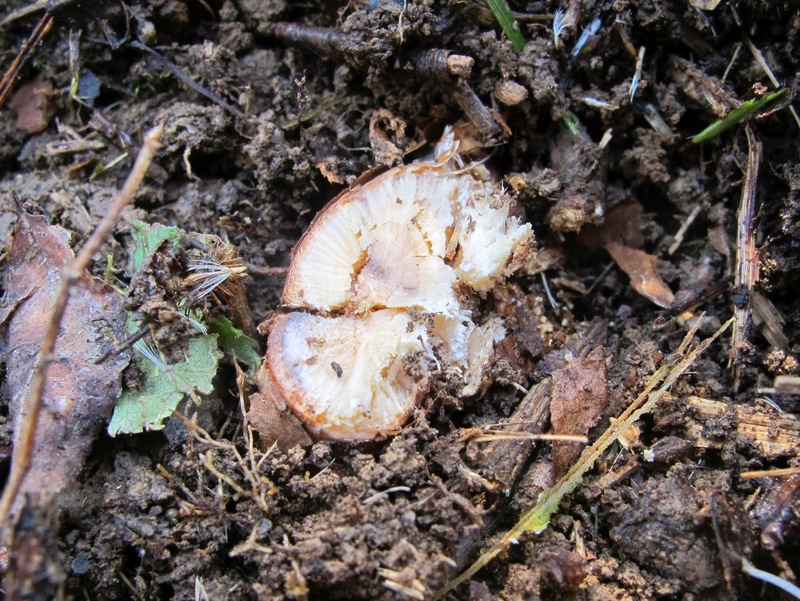 If it becomes a problem in the future, it is easy to eliminate by cutting and stump spraying. I’ve been watching this patch of native rose for several years. It has been slowly spreading, but has not produced any blooms. 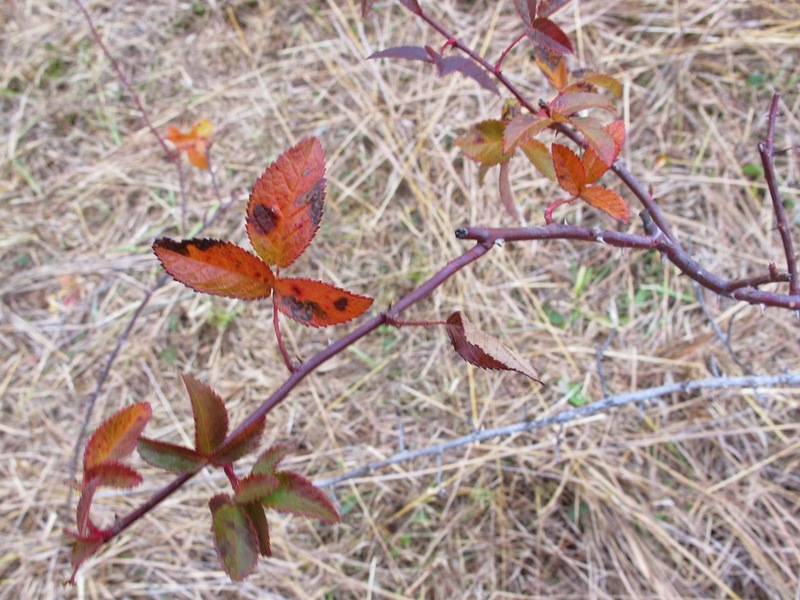 Native roses have thorns, but the thorns are generally less of a threat than those of the invasive Multiflora. I like to think of the bite of native rose thorns as a nip from a playful puppy. By comparison, the bite of the Multiflora Rose is more like a mauling by a mad dog. 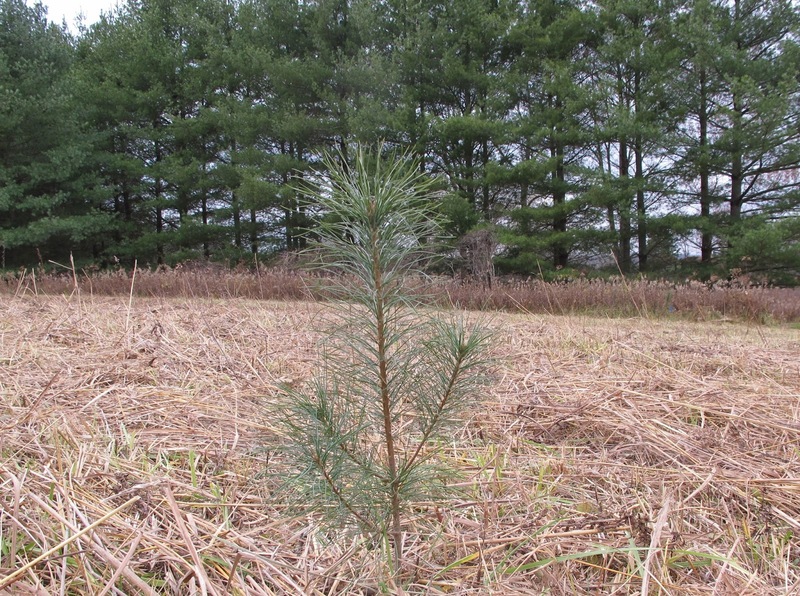 I don’t plan to allow any of these White Pine seedlings to remain in the field. 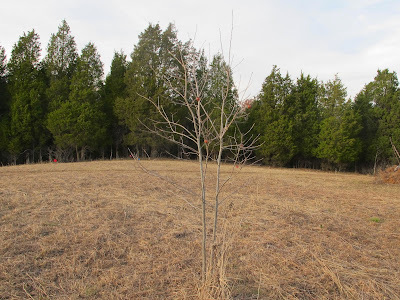 My plan is to transplant a few of them as replacements for deer damaged trees planted in a double line beside my established White Pine windbreak along the side of the yard. Those trees in the background are the seed source for the seedlings. 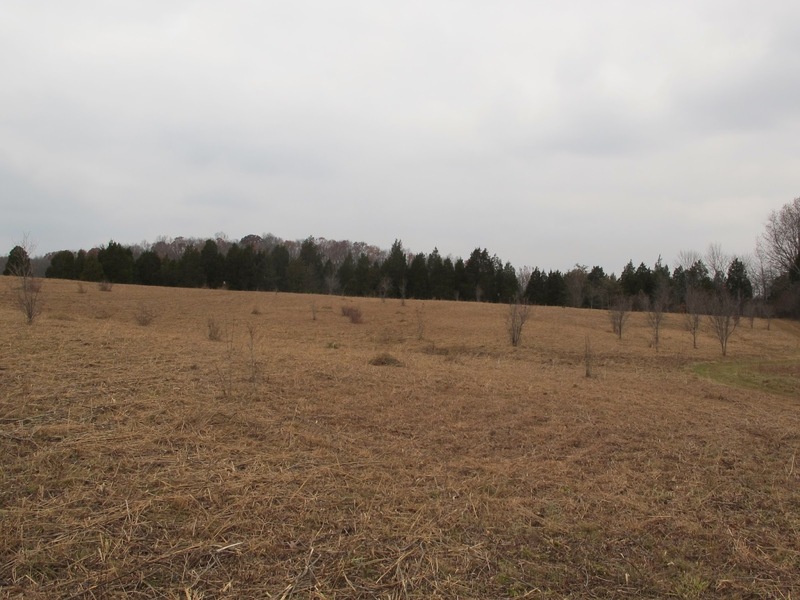 The fact that these little trees have been able to survive for two or three years in the field, suggests that they are ideally suited to grow in their planned location. The field is full of these Cut-leaved Grape Ferns, Botrychium dissectum. They are short enough that the mower blades do no more than shave a bit off the leaf. I’m amazed at how well these plants do in association with the tall grasses. Even though there is just the one species growing here, the natural variation in leaf shape makes for an unending variety. Some things I avoid, not because they are to be saved, but because an encounter might damage both me and the mower. Seasonal wet spots in the field still hold deep tire tracks made at the time the last crop was harvested. Most ruts have mellowed down and filled in, but a few of the worst persist. 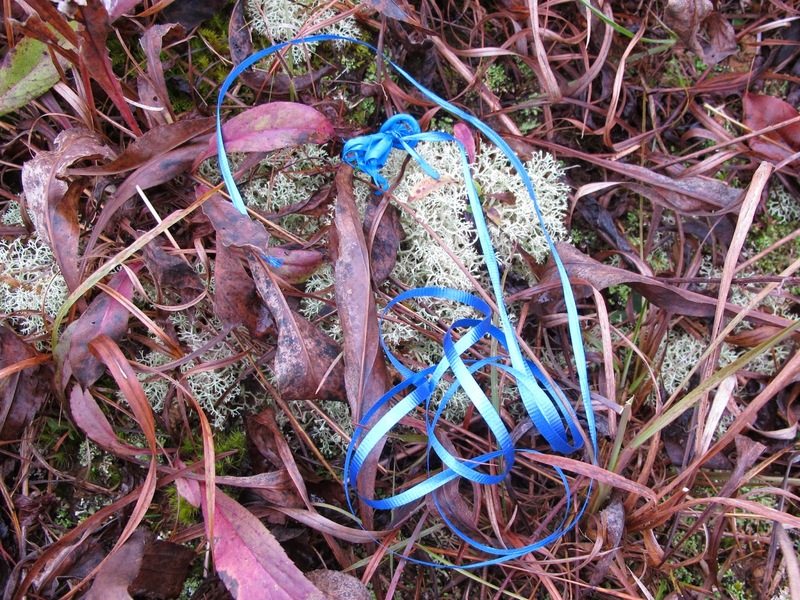 Another freshly dropped balloon. This is number eight for the year, making this an above average year for balloon fallout. It wouldn’t be tragic to mow over this bit of litter, but having the ribbon wrap around the mower shaft and wedge between the shaft and blade can create a mess that I’d rather not deal with. I believe my 2014 mowing struck a good balance between cutting what needed to be cut and avoiding those things best left untouched. Mowing the fields is made slightly more difficult by obstacles that must be avoided by the mower. 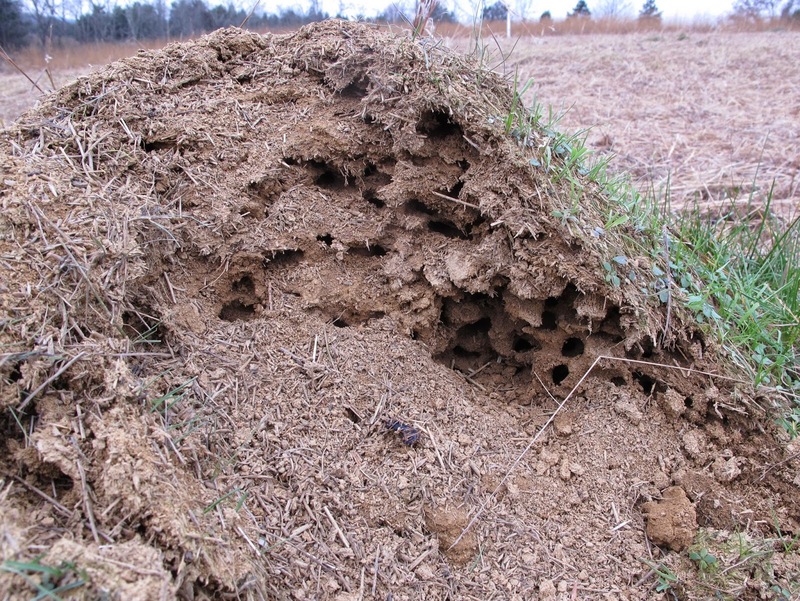 Top of the list is the earthen mound made by the Allegheny Mound Ants, Formica exsectoides. 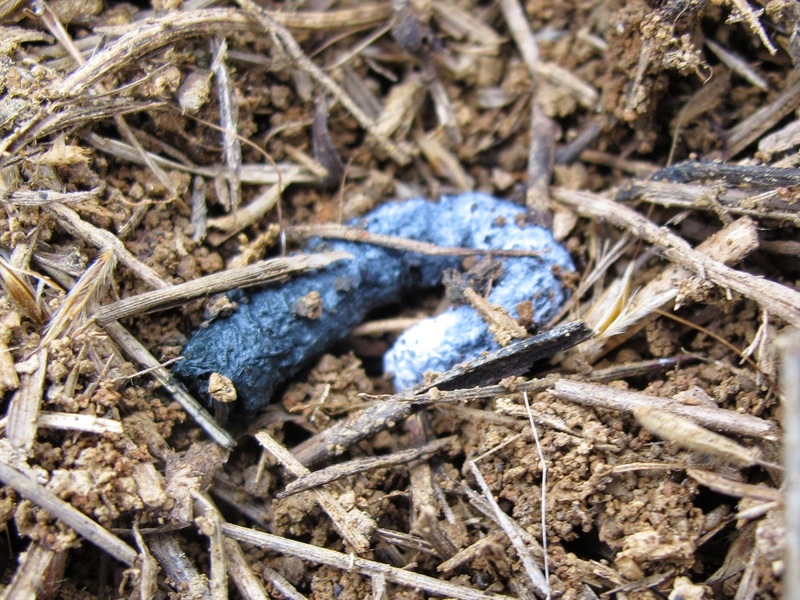 A mower and mound confrontation is detrimental to both parties, with the ants and mower operator taking the brunt of the negative impacts. 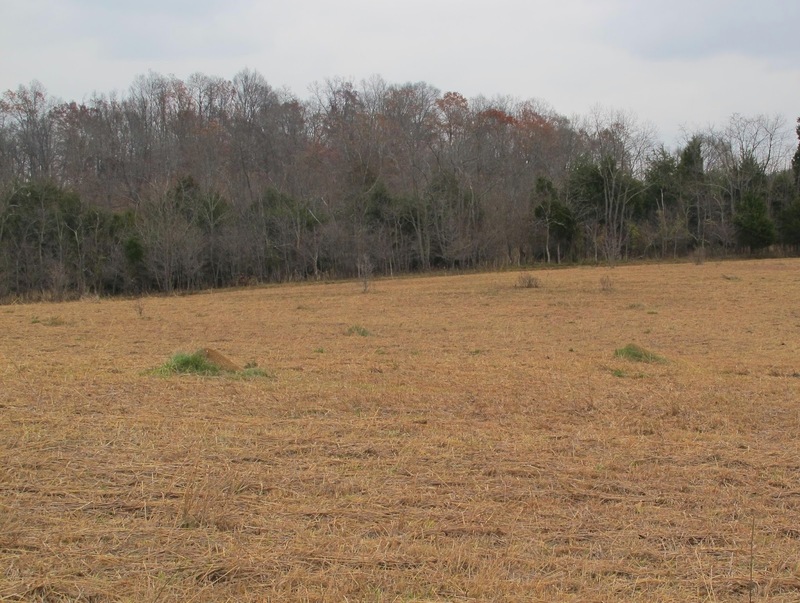 Large mounds that are kept free of vegetation are easy to see and avoid. Not all mounds are so well groomed. 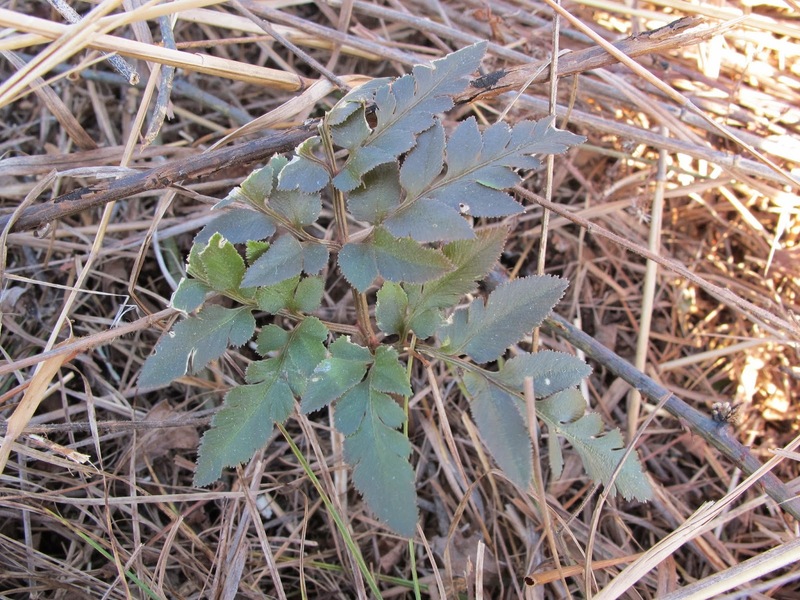 Some are so much a part of the vegetation that the two are inseparable. Mounds such as this are nearly impossible to detect. Most fall into the middle range with bare tops and vegetated sides. I don’t understand why some colonies keep their mounds vegetation free, while others in seemingly identical locations, allow plant growth to cover the mound. 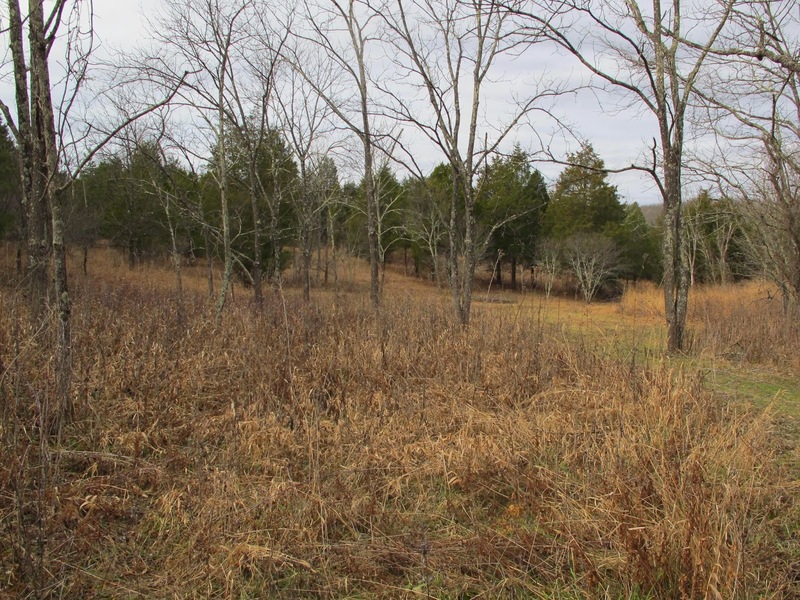 There is also the occasional abandoned mound that still stands tall and is covered in plant growth. These mounds are a little more solid than one that is active and can cause quite a jolt when hit by the mower. These abandoned mounds are often recolonized and rebuilt to their earlier dimensions. I was pleased to complete the field mowing with only four mound hits. 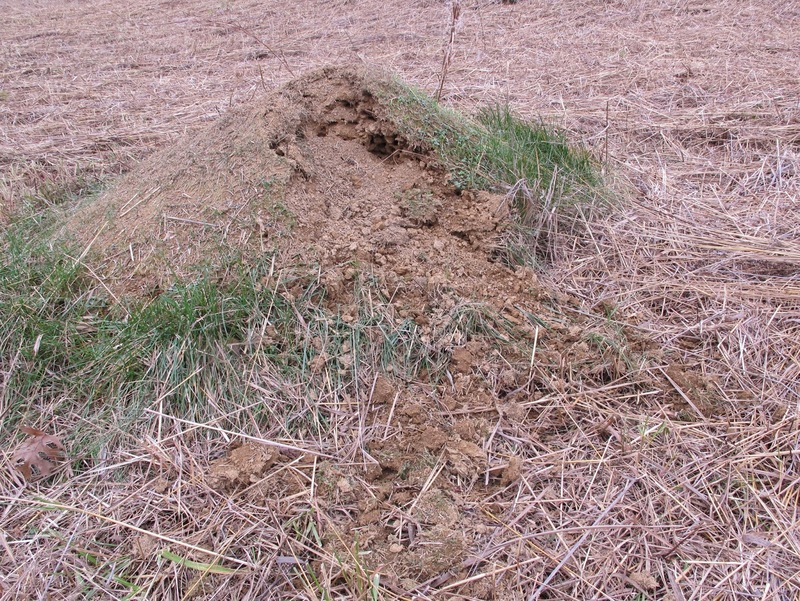 Two took the tops off of very small mounds, one of which showed no signs of recent ant activity. The other two hits were glancing blows delivered to medium sized mounds less than 12 inches tall. The ants have already closed the breaches to their mounds. Unfortunately for the ants, there are other threats that prove more formidable than my mower. 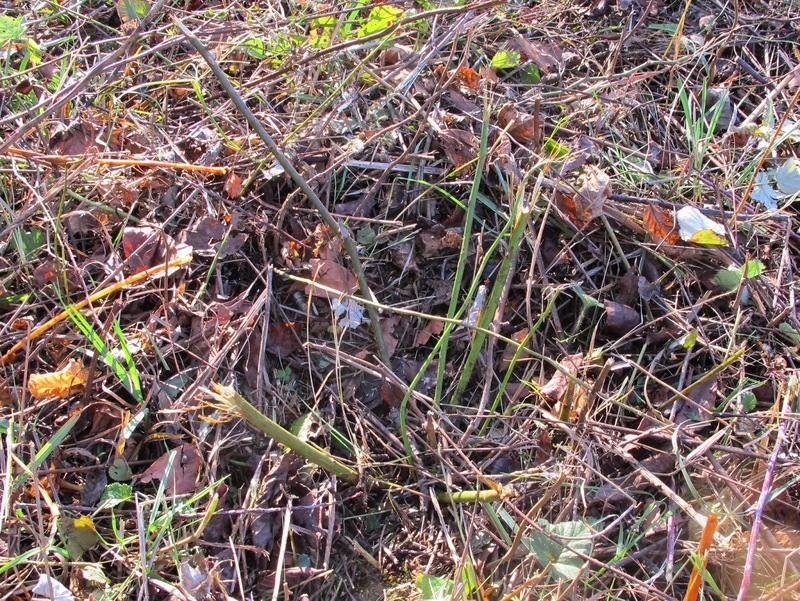 Something attacked this mound and spread debris several feet into the field. 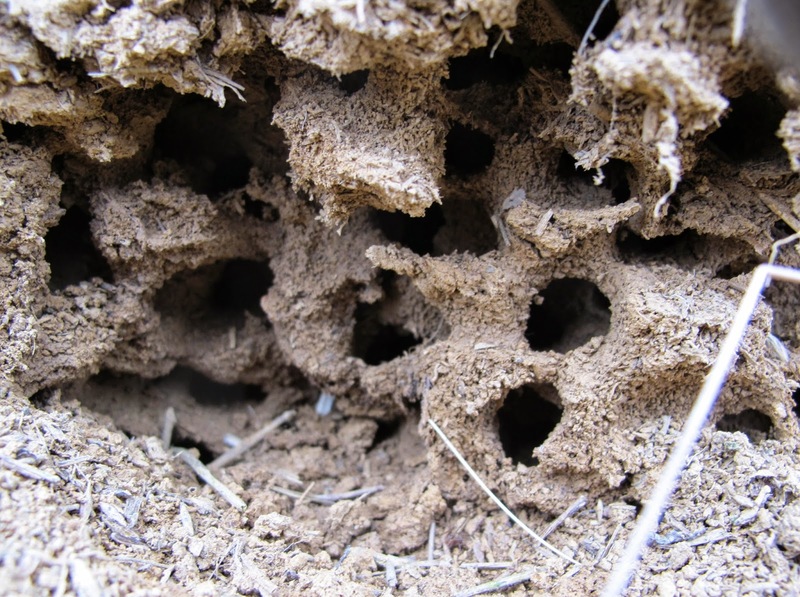 The ants have made some attempt at repairs, but the cold temperatures have hampered their efforts. Many chambers are exposed to the air, compromising climate control within the mound. Exposed tunnels at the top of the mound can allow heat and moisture to easily exit. I imagine these tunnels have been sealed shut somewhere within the mound itself. 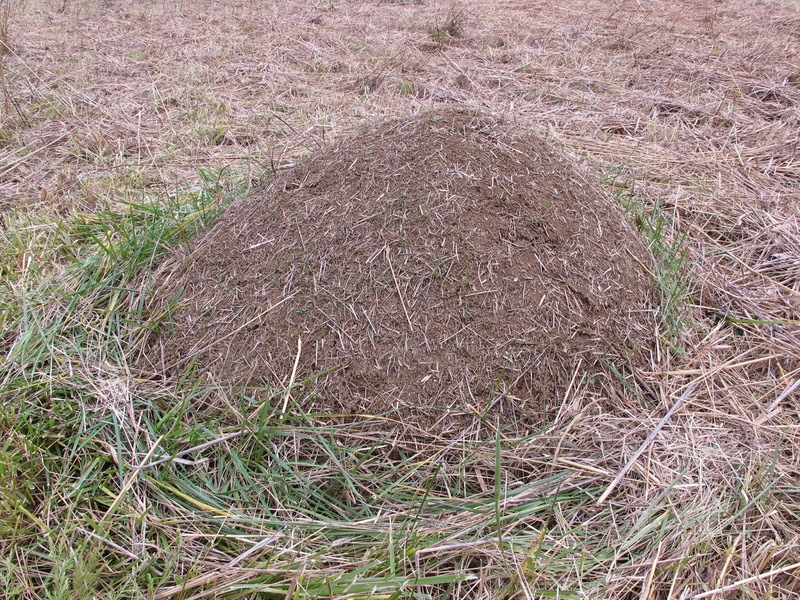 I’ve seen animals nearly take a mound down to nothing and the ants build it right back up again. 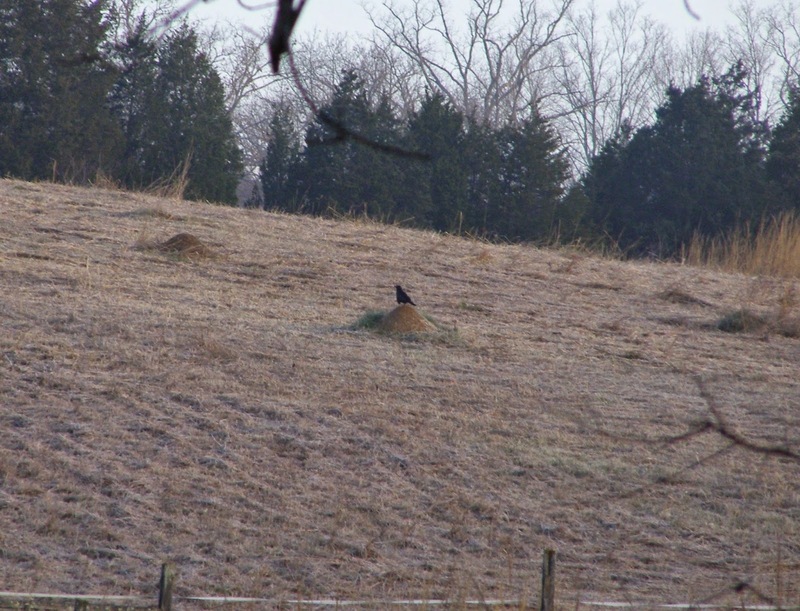 Crows have taken to using the mounds as perches as they forage through the mowed field. They don’t seem to have any real interest in the mound and don’t do any damage. The only evidence of their frequent visits is a growing collection of Crow droppings. 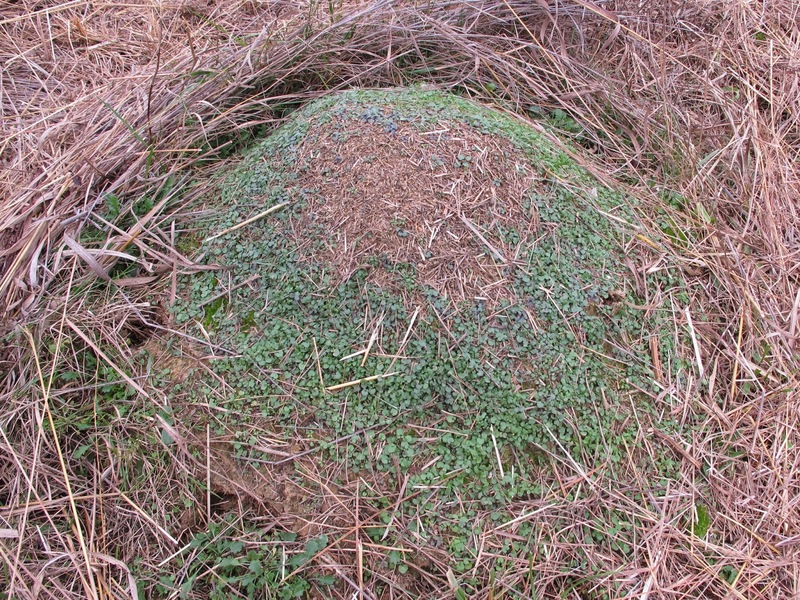 Most of the vegetation on the mounds appears to be non-native in origin. 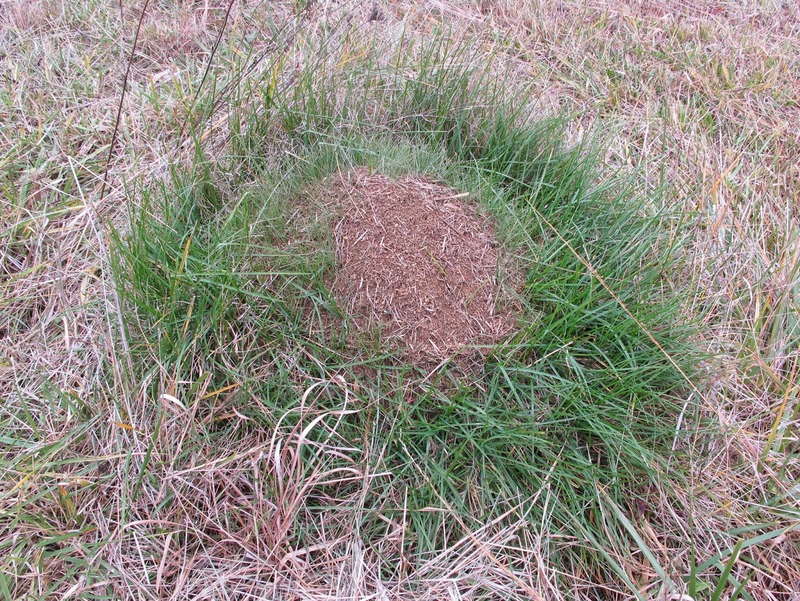 The halo around this mound is a mix of bluegrass and fescue, both species that already had a presence in the field. Several mounds host a mix of exotic species that are found only on the mounds. These species are mow poised to move into the fields if conditions become favorable. Hairy Bittercress has just made it to the mounds in the past few years. 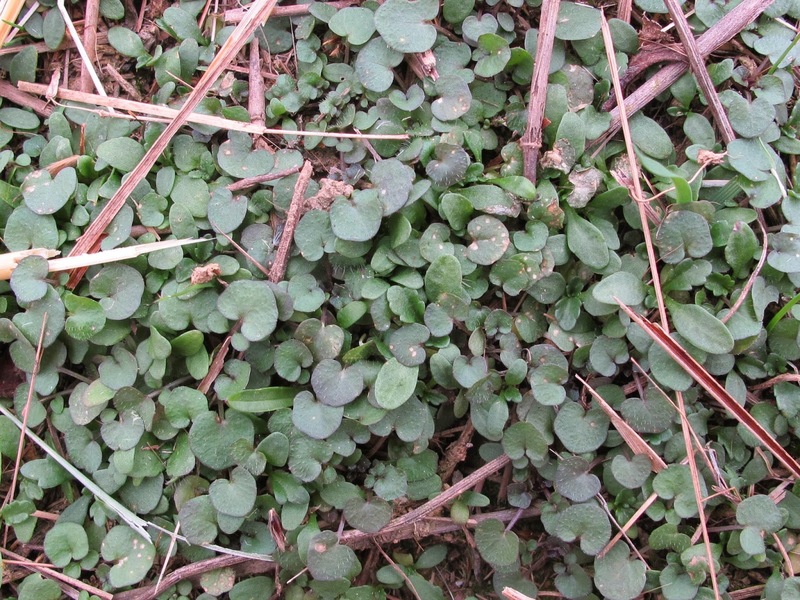 This weedy species began by colonizing disturbed ground near the house and barn. It now seems to be a permanent resident of those locations. I’m wondering now if this species could eventually present a threat to the winter annuals growing in the barrens. I’m not sure how the seeds are traveling, but their method is obviously efficient. I’ll have a few months to visit with these mounds before the tall grass returns to once again hide them from sight. After that, I won’t see most of them again until the next time the field is mowed. I’ve added a new species to my list of woodies that readily colonize an open field. Persimmon, Diospyros virginiana, has aggressively infiltrated the field, growing with such vigor that it has produced fruit in just five years time. That fruit is full of large seeds ready to claim their place in the field. These Persimmons were the only woody species that grew so large in five years that I chose not to run them over with the mower. The mower would have taken it, but the blade gets worn enough on small stems. 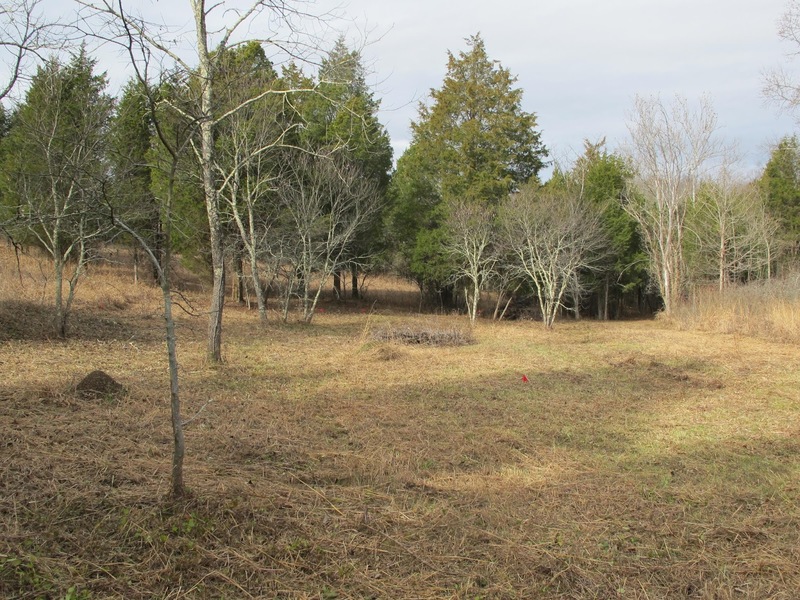 There are a very few mature Persimmon trees scattered about the property, but none are especially close to this part of the field. I suppose some animal stuffed with Persimmon fruit spent a relaxing time here in the corner of the field and dropped the seeds around. Most of the woody plants were small and easy to handle. 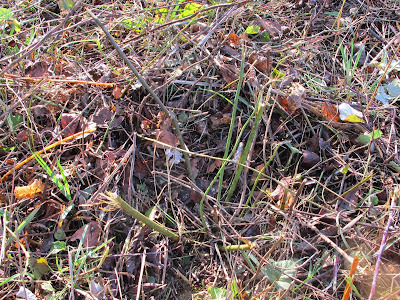 There were several dozen young Multiflora Rose plants, some with multiple stems radiating from a central root. The mower shortened the stems, but the plant still needs to be trimmed down in order for the herbicide spray to be effective. By sliding my loppers in beneath the stems, I can cut the rose at ground level where the plant is concentrated into a single trunk. 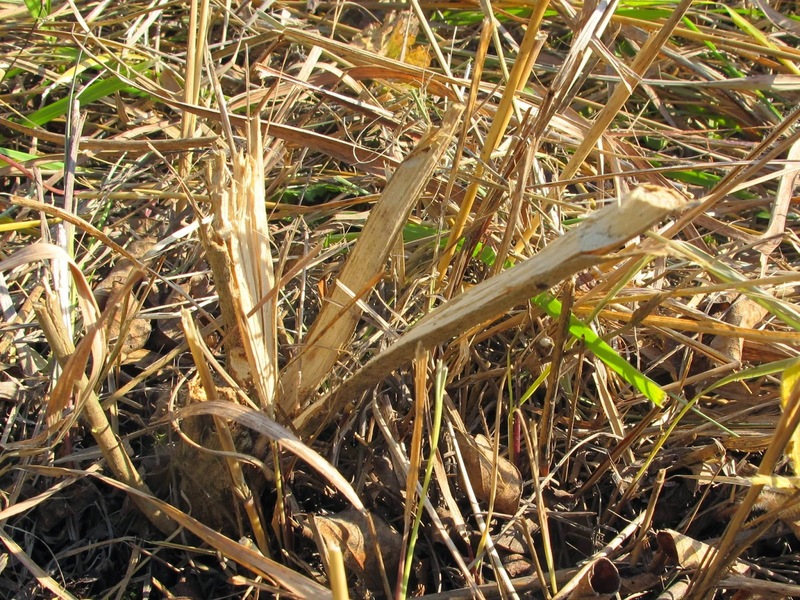 Glyphosate is easily applied to the single cut and will effectively kill the plant. Yucca filamentosa is beginning to show some aggressive invasive tendencies. The basis for the name is easy to see from the fibrous filaments exposed atop the shredded leaves. These plants are obviously growing from seed, but Yucca plants have just a single pollination agent in the form of a Yucca Moth. Without the moth, the plant is not pollinated and no seed results. I have been looking for 25 years to see a Yucca Moth visiting the Yucca flowers and have yet to find one. Apparently I’ll have to try even harder. 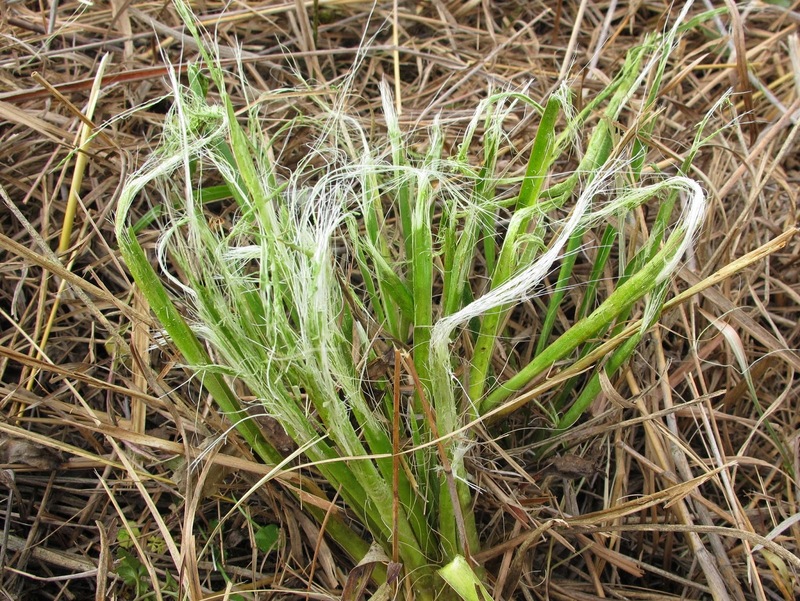 At first glance the Yucca basal rosette appears to represent a single plant. Actually, the clump is composed of numerous plants and slowly spreads to occupy more and more space. 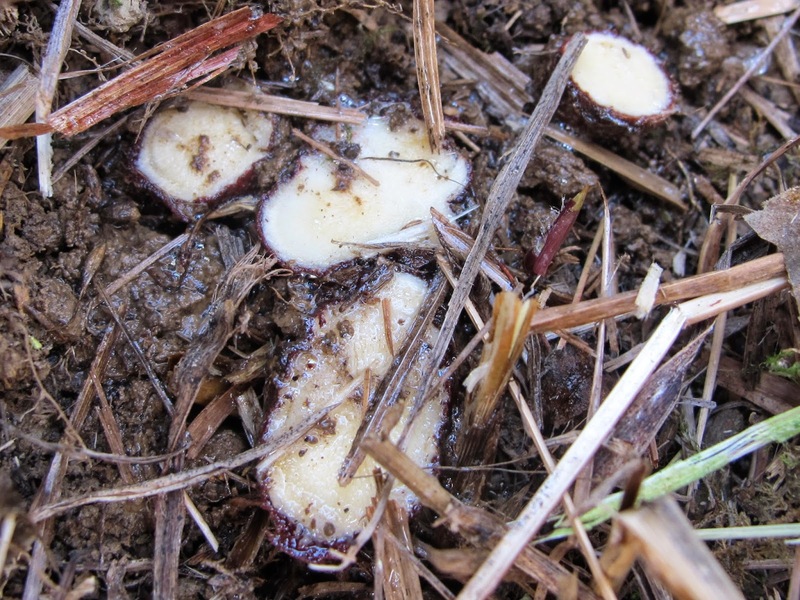 Each stump gets a little squirt of glyphosate. This is my first year treating Yucca stumps in this manner, so I’ll have to wait until next spring to see if the plant is completely killed. The mower blade shatters the stumps of most woody plants. 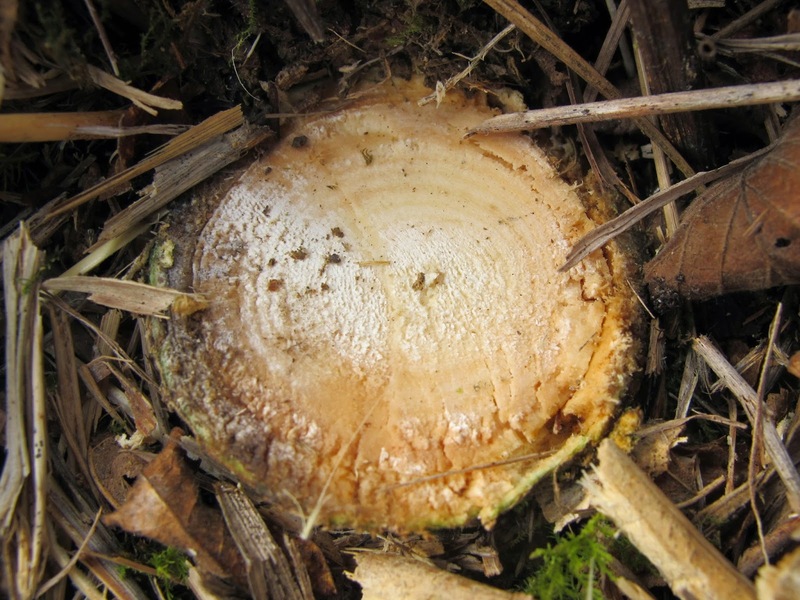 Spraying herbicide on a stump in this condition is usually ineffective. Those splayed ends will die from dehydration and the glyphosate will not move into the living tissue. More likely, the stump will sprout new stems at ground level. This Ash stump looks to have been cut off and left untreated when the field was mowed five years ago. 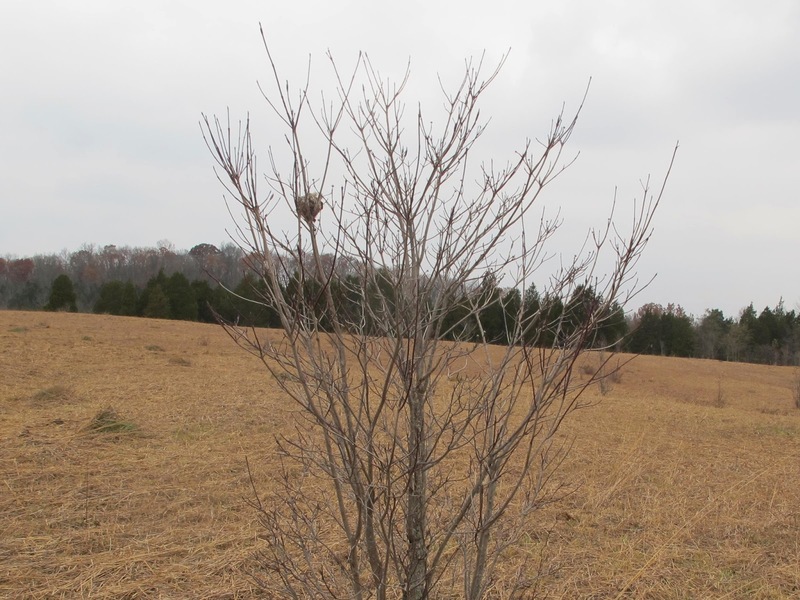 The most effective way to eliminate this tree is to cut below the sprouts and apply herbicide. I settled on November 1 as the beginning of my field mowing season because woody plant species seem particularly susceptible to a stump treatment of glyphosate at this time of year. This treated Ash will not be growing again.